A CLERGYMAN who lost his mother to suicide will undertake a charity cycle for mental health this weekend with Donegal included in his 400km route. Reverend Dr Robin Stockitt, whose mother died 30 years ago this week, will be joined by thirteen friends as they visit eight Church of Ireland cathedrals as part of the marathon event. The cycling pals - both Catholics and Protestants - hope to raise £10,000 (12,000 euro) for two charities including Cycle Against Suicide in the Republic and a renovation fund for Rev. Stockitt's local parish hall in Donagheady, Co Tyrone. 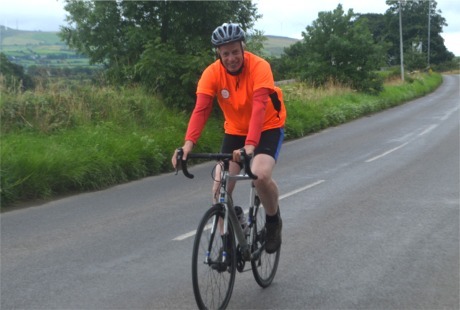 Reverend Robin Stockitt who will undertake a charity cycle in memory of his mother who died by suicide in 1986. The cleric's interest in mental health stems from his own family's loss as well as his interaction with parishioners who have been bereaved by suicide. The Church of Ireland rector lost his mother to suicide on August 3, 1986. He said Northern Ireland has the highest rate of suicide in the UK at 16.5 per 100,000. "This means that in the 18 years since the 1998 Good Friday peace agreement, more people have died through suicide than were killed in the 30 years of 'The Troubles'." The three-day charity cycle begins this Friday and will include visits to cathedrals in Raphoe, Co Donegal; Derry, Fermanagh and Belfast.